"Risky" Ginkgo tree at Hibiya Park in Tokyo, next to Matsumotoro Restaurant. It is one of the oldest parks in Japan. 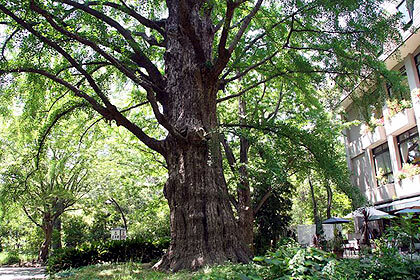 The largest Ginkgo in this park is 400 or 500 years old, girth 7 m.
It is named "Risky" Ginkgo because it was to be cut down to make way for expansion of Hibiya Street in 1901. But Seiroku Honda, the main designer of the park, wanted to relocate the tree even though he put his career at risk doing so. It took 25 days to move the tree 450 meters in the park. The Ginkgo survived.